A desperate siege is unfolding in the Manus detention centre. The 600 men inside the centre are standing up to what seem to be insurmountable odds. They are surrounded by the PNG navy; the same people that threatened the lives of refugees last Easter when shots were fired into the centre. The Australian government is depriving them of power, water, and food as they attempt to drive them from the detention centre into even more unsafe areas of the Lorengau settlement. Two of the three areas set aside by the government are not even completed. There are no arrangements for providing food or medical care should they be driven out of the detention centre. With no prospect of secure resettlement in a third country, being forced to move from the detention centre is a move to more insecurity and increased danger. Dutton strenuously denies that Australia has any responsibility for the refugees and asylum seekers on Manus—but that lie is more and more exposed as the crisis unravels. Even PNG government ministers are now making public statements insisting that the refugees are “Australia’s problem”, and that Australia must play a role in providing for their future. The courageous stand by the refugees has struck a chord. People are sick and tired of Dutton’s relentless refugee bashing. With the government badly behind in the polls, the government hopes that anti-refugee policies will maintain their popularity. But people are disgusted by the shocking conditions the government is inflicting on the refugees. Students have occupied immigration offices, workplaces have taken up the slogan, “We Stand With Manus”, and tens of thousands of dollars have been raised to help provide food and water to break the siege. The refugees at Manus have always been a thorn in the side of successive Australian governments, their determination a constant reminder of the government’s callous disregard for refugee lives. 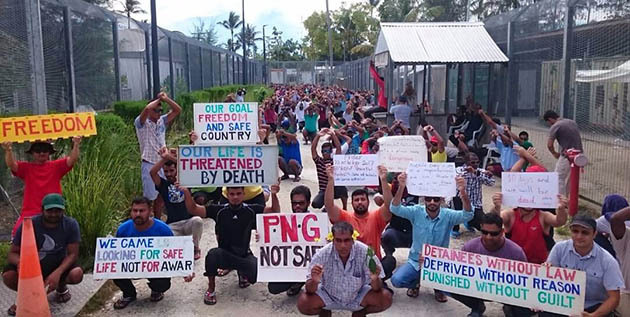 In 2015, hundreds of Manus detainees staged a mass hunger strike when the government first tried to force them to East Lorengau. The year before, 2014, locals had attacked the camp and murdered an Iranian asylum seeker, Reza Barati, and injured scores of others. Some had their throats cut, others were blinded. Refugees feared for their lives if they were forced to live outside the camp. In 2015, the government took scores of asylum seekers labelled “ringleaders” to prison in their attempt to break the hunger strike. After several days, the government took away the drinking water in an effort to snuff their resistance. After 13 days, the hunger strike ended. But it won. Not one refugee has been forcibly transferred to East Lorengau. The refugees’ fears have been confirmed in blood. Since 2015, many refugees have been bashed, robbed and mutilated with knives and machetes in attacks around the Lorengau settlement. The refugees’ stand has exposed the naked brutality of the offshore detention policy, and the government’s politically driven motives to starve them into submission. Against astounding odds, the refugees have refused to move. Standing guard, securing fences, collecting rain water, digging wells—their resistance is a tribute to human endurance and determination to face down the pitiless actions of the Australian government. The violence of the Turnbull government is something that has become better understood. But the Labor Party is also responsible for what is happening on Manus. It was a Labor government that started the Pacific Solution II in 2013, and handed it to the Liberals. In the face of the humanitarian crisis on Manus, Shorten has told Turnbull, “Doing Nothing is not an option.” But that goes double for Labor. Bleating at Turnbull does not cut it, when it is the horror of Labor’s policy that is exposed on Manus. Shorten now says Turnbull should take New Zealand’s offer of 150 refugees a year from Nauru and Manus. Turnbull is not about to allow that. Neither the US deal, nor any deal with New Zealand is going to solve the crisis. There is only one alternative for those who have been tortured on Manus and Nauru: Bring them here.